NATORG Kids Probiotic Plus New Zealand Colostrum is a great-tasting, New Zealand blackcurrant-flavoured chewable tablet that the kids will love. 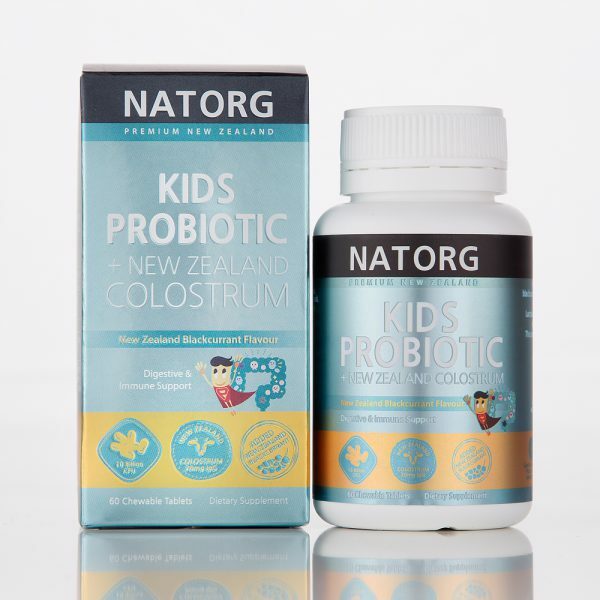 It provides specially selected and scientifically-researched probiotic strains and New Zealand sourced colostrums that help to support children’s digestive and immune system. Kids Probiotic Plus New Zealand Colostrum contains 100mg of New Zealand Colostrum providing 20mg of immunoglobulin G (IgG). Each tablet contains 10 Billion CFU Probiotics and 10mg New Zealand blackcurrant powder. Lactobacillus rhamnosus and Bifidobacterium lactis are researched form of probiotics that support and balance digestive health. Why added New Zealand colostrums powder? New Zealand colostrums powder is a concentrated source of important immune and growth factors, including IgG and IgA. What makes high quality colostrums is high-quality cattle and high-quality processing. NZ colostrum is favourable because of its dairies stringent standards of quality. New Zealand collects colostrum from all over the countries. It is then blended together therefore enlarging the environmental exposure and variety of cows that colostrum is collected from widening the defensive net against a wider variety of pathogens. Children 2-4 years: Take 1-2 tablets daily, between meals. Children 5+ years: Take up to 4 tablets daily, between meals. This product contains bovine colostrum powder which contains lactose and cow’s milk protein. It may not suitable for those who intolerance to lactose/milk allergy. To be safe, this product should not be given to children under age of 2 years old. Please seek advice from your health professional if you have concern.